Attracting and retaining loyal customers is the critical element in growing a profitable business. When conducting customer satisfaction studies, The Strategy Group employs a simple, yet powerful analytic technique to identify the key drivers of customer satisfaction within your product category and profile how successful your brand is in delivering these key brand loyalty factors. The analysis involves collecting and simultaneously plotting the importance level of category product attributes versus the score a particular brand receives on those same characteristics. The procedure generates four "satisfaction" quadrants and reveals insights into how a brand's customer satisfaction and retention can be improved. In the upper right quadrant fall all those characteristics that are considered important to customers and are currently adequately delivered by your brand. It is important to continue to deliver these characteristics in order to maintain current levels of brand loyalty and market share. In the lower right hand quadrant fall all those characteristics considered important by consumers but currently, not adequately delivered by your brand. Immediate gains in market share can be had by strengthening the brand's image in these important areas. 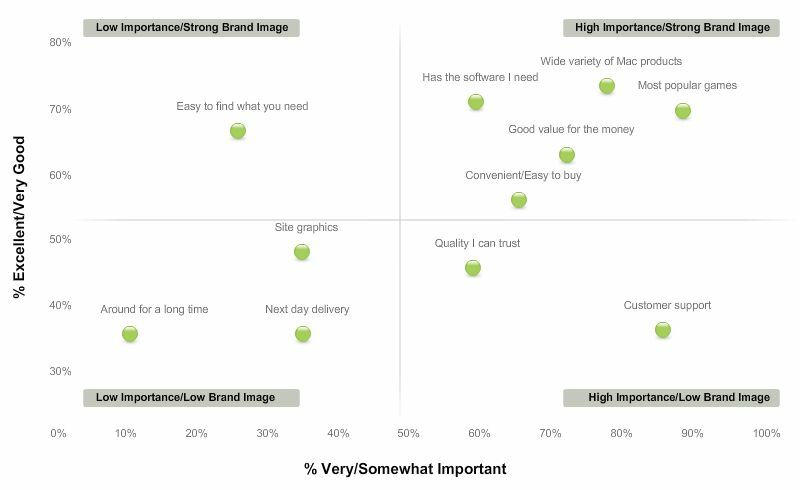 In the upper left quadrant fall those characteristics that are less important to consumers but, at the same time, are areas where your brand is considered to be strong. Marketing opportunities exist here to the extent that the importance of these characteristics can be heightened in the mind of the consumer, thereby increasing the leverage represented by your brands strong image in these areas. In the lower left quadrant fall all those characteristics that are neither considered important to consumers nor delivered by your brand. Little to no marketing opportunity exists in these areas.